Samuel Magaw was born in rural Pennsylvania in 1735, probably in Cumberland County. He was an educated man who devoted his life to learning and religion. 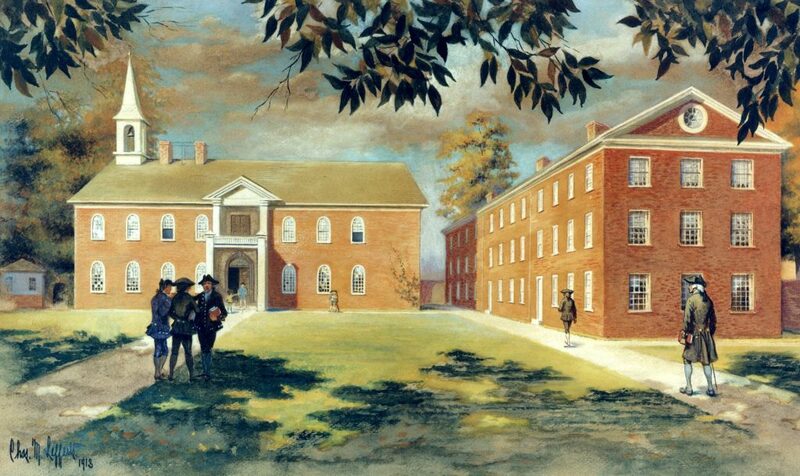 Magaw graduated from the College of Philadelphia with the Class of 1757, the college’s first class. As a young scholar, he sought assistance to meet his tuition, and is the only student in his class known to have attended on a scholarship. In 1755, the trustees agreed to establish a series of charity schools aimed to foster education among the German immigrants in the area. To answer the immediate need for German masters, Provost William Smith proposed Magaw take charge of the school after studying German for a few months. In return, the trustees of the German Society agreed to pay his lodging and board. Smith also arranged for the Lutheran Minister of Philadelphia, the Reverend Peter Brunnholtz, to board Magaw in his house, watch over his morals, and assist him in making further progress in the German language. Thus, Magaw was able to continue his education at the College with the help of this scholarship. At the suggestion of the college authorities, Magaw was educated for a tutorship. Magaw, raised a Presbyterian, studied divinity and then traveled to England in 1767 for ordination as an Episcopal priest. When Magaw returned to America he served first in Delaware as a missionary of the Society for the Propagation of the Gospel. He then became rector of Philadelphia’s St. Paul’s church from 1781 to 1804. Magaw was vice provost and professor of moral philosophy at the College from 1782 to 1791. Later in life, he helped his friend, James Abercrombie, found the Academy of the Protestant Episcopal Church in Philadelphia. Magaw died in Philadelphia on Dec. 1, 1812. His first wife was Sarah Vining, who he married in 1771 and who died in 1773. He later married Lucia Bell who died in 1790; their son Algernon Sydney Magaw was a student in the Academy of Philadelphia and graduated from the University of Pennsylvania in 1794. His third and final wife was Martha Doz, daughter of Andrew Doz of Philadelphia.